Paper Bursting Strength Test Machine is fit for products which are packaged by corrugated paper such as electronic instruments, electric ware, hardware, bike, valise, food, shoe, furniture etc, to test the bursting-resistance strength of paper box; it can also test cloth and synthetic leather. 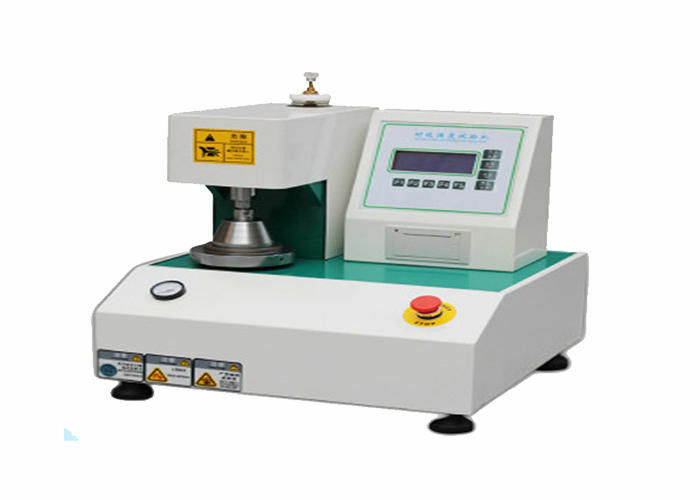 The bursting strength tester is adapted to the signal output of pressure. While specimen is breaking, the max. breaking value will be kept with the alarm buzzer & alert light automatically. Its Accuracy has promoted 20 times more than the traditional gauge. 1. Micro-computer control, use hydraulic oil as the driving force to break the specimen. 2. When the specimen is broken, it stores the maximum and reset automatically. 3. LCD displays, the unit of kgf/cm2, psi and kPa in option. 5. ISO 2759 and ISO 2758. 6. running joint is made of brass so that prolong its life-span.